Anisophyllea disticha is one of the species of genus Anisophyllea that is not pharmacologically investigated despite its high utilization by the folklore. Leaf, stem and root of this plant are being used especially in treating diarrhea, dysentery, jaundice, refreshing men’s body, revitalizing the birth canal of women after delivering the baby as well as relieving weariness and body aches. The medicinal properties of A. disticha are predicted based on a literature review that provides information on secondary metabolites present and biological activities of this genus. The most reported biological activities comprise of antimicrobial, antioxidant, anti-diabetic and DNA damaging activity. From the previous studies, it can be observed that the extraction of bioactive components from this genus has been conducted using conventional method such as maceration, percolation and soxhlet. 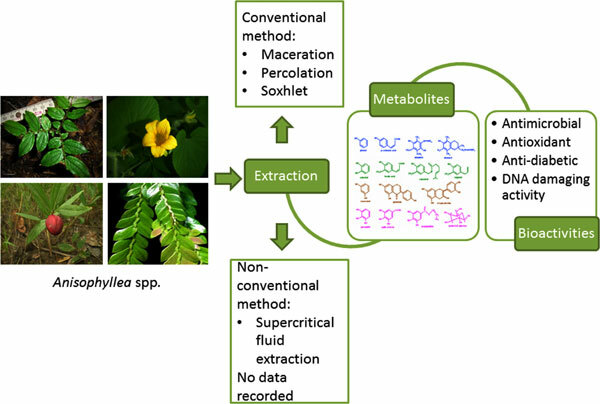 In this review, phytochemical contents, bioactivities and the methods of extraction of bioactive compounds from genus Anisophyllea have been broadly discussed. The advantages, as well as disadvantages of both conventional and non-conventional extraction methods have also been explained. Therefore, the extraction using non-conventional method like supercritical fluid extraction could provide the opportunity to obtain highly purified chemical constituents with potential in the application of various fields. Anisophyllea disticha, bioactive compounds, phytochemical screening, bioactivity, supercritical fluid extraction, carbon dioxide.